Rising Customer Returns in Retail should not be the new normal. Finally, a solution for retailers and brands to manage and reduce their rising returns rate. Consumers expect Fast, Free and Easy Returns... but... Rising Returns Rate do not have to be the New Normal in Retail. Newmine, LLC. announces the launch of their revolutionary cloud-based software to reduce customer return rates. Chief Returns Officer™ enables retailers and consumer brands to take omnichannel commerce profitability to the next level. 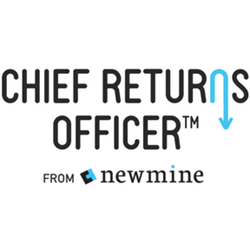 "We recognize that offering fast, free and easy returns is important to the success of retail brands," said Navjit Bhasin, founder and CEO of Newmine. "But that doesn’t mean that returns should be left unmanaged and unchecked. Reducing consumer returns can potentially add millions to the bottom line. This can provide funding for growth initiatives, improve company valuation, and even avoid bankruptcy."